.........Finding Yes!......... 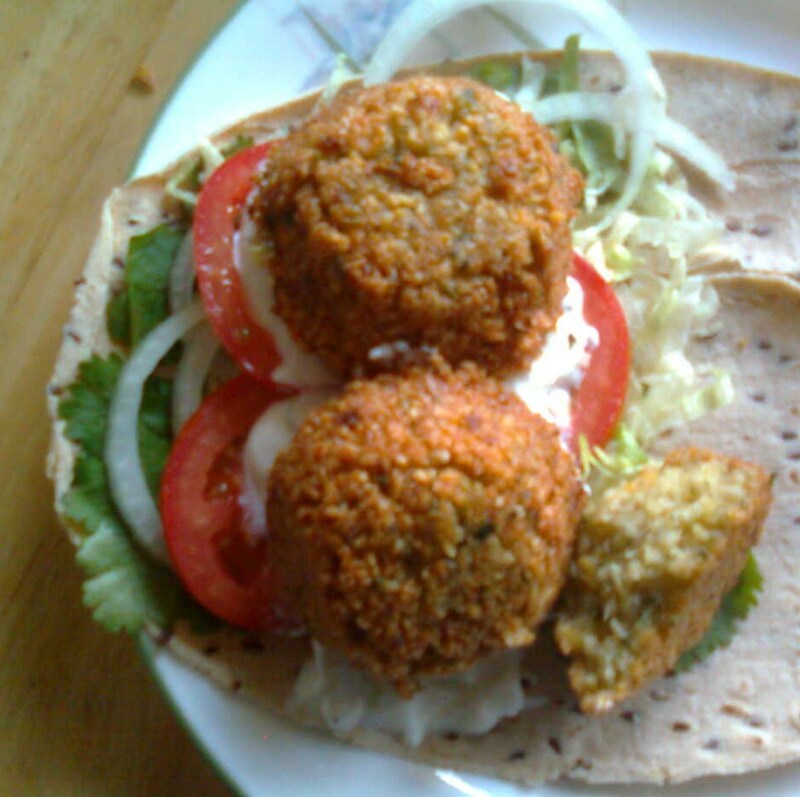 : The Perfect Falafel, ya'll! I love falafel, you guys... I love it so much I'm willing to drive clear across town to get a decent wrap. For years I toiled with endless recipes, trying to get the texture and flavor of these delicious, yet unexpectedly tricky fritters. After fiddling with countless recipes and box mixes, I finally got it! It wasn't easy, but Oh Dear was it worth it. This recipe will beat any box you can buy, and dare I say, I like it better than my favorite falafel place. No joke. Soak chickpeas in water overnight. They will double in size. Stick everything in a food processor and blend away! You may have to do it in batches. No biggie, just stir everything together in a big bowl when you're done. ** The big trick, which took me a few tries to get right, is to blend the chickpeas enough. They should look similar to couscous, or just super tiny grains of rice. Don't be afraid to do this, or your falafel will fall apart in the fryer. Just keep going until they look teeny tiny and uniform, but stop before you make a paste, cuz that's just hummus... unless you want hummus, in which case... but I digress. Refrigerate for about an hour to set. Heat about an inch of oil in a skillet on medium/high heat. Form little balls or patties, pressing hard, making sure it's compact. Is this a messy thing? You bet it is. If you have an ice cream scoop, press that batter in there and go to town, but any concave surface will do. I used a large ladel and pressed the batter down with a butter knife, then slid it into the oil. Try a few things, see what works for you. If your falafel are too hard, you are frying them too long, or they are too small, make them bigger. They should be light golden brown. Taste the first one, add salt if necessary. I know it sounds complicated, but once you get the hang of it, it's super easy. I suspect I'll have a much easier time now that I've worked out all the kinks. ** You can bake them at 400 degrees, 10 minutes on each side. I tried this. They're good, but also a little dry. This makes a lot, but you can freeze them and re-heat them in the oven for a quick meal, or make a wrap for lunch tomorrow! I suggest slapping some tzatziki on there, hummus is good too. Enjoy!